24/9/2018 – Fixed the RRP, thanks to a correction from Filip in the comments. High Society is a clever game, with an auction system that manages to be easily understood while still being deeply unintuitive when it comes to assessment of value. We gave it three and a half stars in our review mainly because we’ve had a hard time on occasion getting people to be willing to give it a proper chance. If you find a more receptive audience you’ll find a beautifully packaged game in here that offers a lot of tight, taut, tense auctioneering. Don’t forget your crampons. You don’t care about that though – you’ve already got our review committed to memory and whisper it like a liturgy every night before bed. You’re here for a different take on the topic – you want to know whether the game is accessible. Let’s see how the bids go. The colours used for the cash cards that you have in hand aren’t ideal as far as colour blindness goes. Every category of colour blindness is likely to have some difficulties in differentiating the different shades and even those without may find it difficult to tell some colours apart in bad lighting. However, this doesn’t actually matter because these represent money values and they only ever get spent in front of a player. They’re never used in any way that isn’t already spatially linked to their source, and once they leave the money supply they have no real recurring impact on game state. The cards upon which you are bidding don’t use colour as the sole indicator of state, using instead distinctive art, descriptive text, and card values that are prominently displayed in the bottom corners. 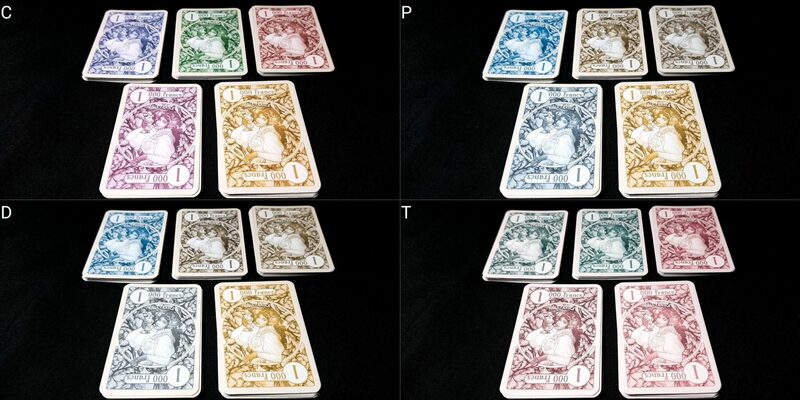 The green cards that represent the tempo of the game (when the fourth of these is played out the game is over) are notably distinctive for all categories of colour blindness including monochromacy. We’ll strongly recommend High Society in this category. The issue here is that the hand of currency cards that a player has is differentiated only by the number value on the face of each. This number is large and well contrasted, albeit against a very busy background. This is likely to be fine for players with minor to moderate visual impairments provided an assistive aid can be brought to bear. If not, this is the key obstacle that must be overcome. There are eleven denominations of card, and this is likely to be more than can easily be represented with real world currency. 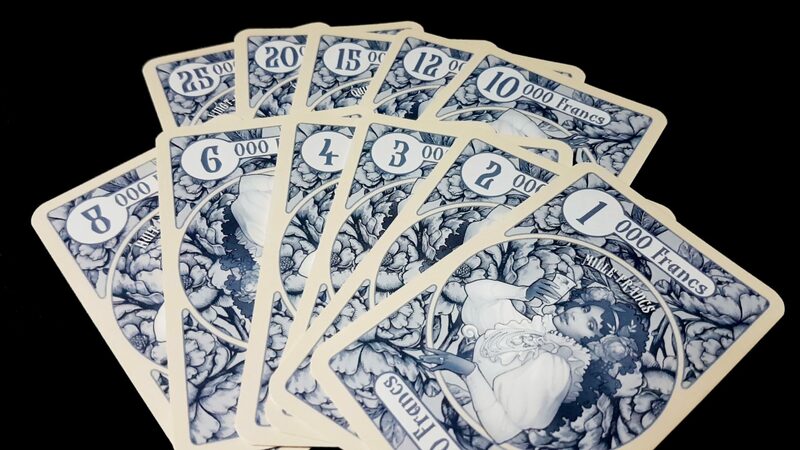 The number of variations and their non-standard configuration too means that techniques such as using the folding method with paper money are unlikely to map cleanly onto the game currency. Even if they did it’s not simply a case here of providing accessible money because you can’t make change or reclaim cards to replace them with higher denomination values. You’d need to have eleven different tokens each representing eleven different denominations while also making it impossible for outsiders to tell their face values. It’s not that this an impossible problem, but it does add a considerable burden of compensation to play. You might for example employ a privacy screen (like a dungeon master might use) and use stacks of poker chips. You could construct something workable with Lego if you had enough of it available. You could make use of indentations applied to the cards. There are options and they would bring the game into full playability even for the totally blind. They are though workarounds about which the group would need to come to a mutual agreement – each would have a game impact beyond that of the affected players. We’ll recommend High Society in this category. 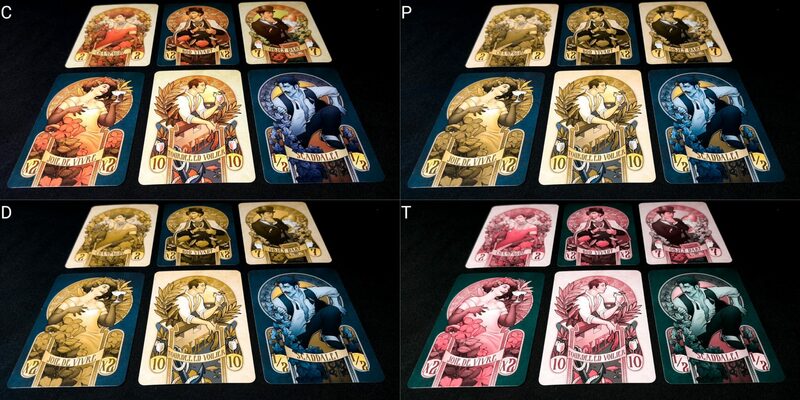 The base game is playable out of the box by anyone that can make out the numbers on the cards. For everyone else it’s possible to workshop a tactile solution that would compensate for the single problematic element of currency. This is a problem category. First of all, the numeracy required is sophisticated in a number of ways because at its core this is a puzzle of precision – getting the cards you play to be in a configuration that matches the amount you want to pay with the cards you can afford to spend. That’s a task of considerable analytical nuance because you don’t get to alter your bids once they’re down. You need to be playing down early bids with the expectation they’ll eventually contribute to a set of cards you’re willing to sacrifice for the offer in front of you. There the issue is further complicated because the cards you’ll want to keep are dependent in part on the cards that have already come out for auction and which cards other people have spent. Spent cards are discarded face down and that means it takes a good memory to track what sum of money and combination of cards everyone else has available. You could house-rule that discards are face up, and that would certainly help, but it wouldn’t remove the fluid intelligence costs that go into making a sensible bid that doesn’t do more harm than good. You can change the game more to render it more accessible with techniques such as letting players change bids that they’ve already made but at that point you’re not playing High Society any more. You’re playing a standard auction with no bite to it. That’s fine – as I said in the review, auctions are fertile ground from which to work because they do a lot of heavy lifting by themselves. There are other games that would likely be more appropriate though because they’ve been designed that way from the start. The cognitively accessible version of this game doesn’t retain much of the core of the experience. Essentially here the problem you have is that these auctions are complex because the bid is more than just a sum of money and that’s the whole point of the game. We don’t recommend High Society in our fluid intelligence category, but we can tentatively recommend it for the memory category provided discards are played face up. High Society enters into some reasonably troubling emotional territory towards the end phases of the game, but it’s largely unproblematic to begin with. You need to think of each card you play down as being a constriction in your future options and clever players are going to make bids with the intention that in their losing, your win is more costly than you might like. You can play small increments in High Society, but if you win an auction the thing is you can’t play them again – when that 1000 franc note is gone it doesn’t come back. Your minimum raise from that point on is 2000 francs. Every single small bid you make in a winning auction is a problem you create for your future self. If the only card you have left to safely spend is a 20000 franc note you’re probably not going to want to spend it or raise with it because it likely overshoots your valuation so dramatically. Bidding just to force up a price is a common auction tactic – in High Society you can do that to deplete the funds of another player but it’s emotionally impactful for both participants. If you try to do it and someone lets you have the win you can feel frustrated that you got caught out. If they try to do it to you and you fall for it you end up losing your ability to participate fully in the later auctions. 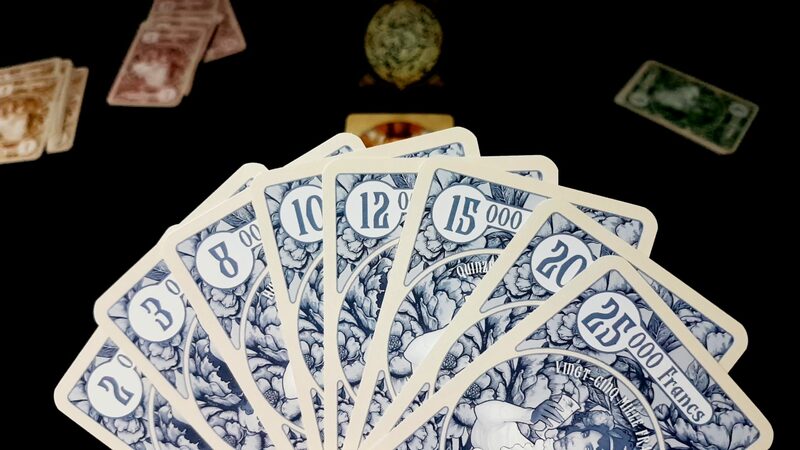 Occasionally, when left with only one card in hand, you may go for several rounds without being able to bid anything. That card is the only thing that that might keep you in the game at all. As implied in the review, there’s also an aspect here where you might lose simply because another player throws the game. You might be the only person that can legitimately bid on a card, and you might be able to get it cheap as a result. If everyone else has only one card, the only way they can bid is by giving up a claim to victory. If they don’t think they’re going to win anyway (perhaps they only have a small value card left) they might simply decide to deprive you of a card, or force you to pay more, simply to knock you out of the competition. Sometimes people might do that for no reason other that simple mischief making, or out of a resentment that you snagged an earlier deal through your clever play. Sometimes it’s just punishment for you playing better than everyone else. Score disparities, as a result of the luxury and disgrace cards, can be significant. If someone gets two of the cards that double score, it doesn’t really matter what numerical card they pick up – they’re probably going to win. If someone is forced to pick up the card that halves their points, they’re probably not going to win. If both players are in the same game the gulf between them can be significant. However, you can never truly be sure. If it turns out your 20000 franc note doesn’t keep you in the final score you might find your anticipated win is stolen from you by someone who accomplished much less with their cards. It’s a big part of the appeal of High Society but it can also be deeply aggravating. Still, these are all things you know going in and it’s not that they’re side effects of the game – they’re part of the challenge of playing it well. It’s possible to learn important lessons about this unintuitive form of auctioning from a loss, and in my experience you come away from that feeling like you can do better the next time. We’ll recommend, just, High Society in this category. You’ll have eleven cards in hand at the start of the game, and this initial set will rapidly diminish over the course of play. A single card holder will likely be appropriate here because the value of each card is in the top left and bottom right corner and as such they can compress down well – all you need to see is a fraction of each card to have full awareness of your finances. Play in the game consists of placing down cards (only picking them up again if you lose the bid) and collecting up the winning bids. There’s no need for precision here, and if that’s too much physical interaction the game is very amenable to play with verbalisation. All a player need do is indicate a bid and have its appropriate card played out. The cards don’t even need to be physically played if everyone is happy with the honour system. That can alleviate some of the difficulties of one player acting on behalf of another in a game of interleaving bids. We strongly recommend High Society in this category. I love the effort that Osprey have gone to in order to make this an inclusive game. It would have been so easy to take the theme of ‘high society’ and depict it with austere white men in top hats. Instead you get black men and women, white men and women, and a few more ambiguous characters. It’s all bundled up too in some stunningly lovely art. You can even see the attention to inclusivity here in the box art, which again plays against type by having a well-dressed black woman set the context for the rest of the game. It’s great, and I know Osprey have been making very conscious decisions in this space for a while now. It doesn’t stumble in the manual either, making use of the second person perspective without any assumption of gender. High Society has an RRP of around £15, and that seems very fair for a small box card game, especially when you can’t take issue with any of the components. The cards feel great, they look marvellous, and the rapidity and ease of play makes it an easy sell for groups – at least until they find out about the sting in the tail. It needs at least three players, and doesn’t excel at that count, but it also plays up to five. This is an auction game that can be played in silence if necessary, because all that’s needed for a player to express their contribution is to play down the specific card that adjusts the bid in front of them. Everything else around the game is optional. There aren’t really many intersectional issues here that would impact beyond the individual grades given. The tentative recommendation we give for the memory category would be a lot shakier were that to intersect with a visual impairment but that in itself would depend on the strategy taken for offering accessible currency. If it’s fully tactile, it might not even particularly make a difference except in tracking the way any individual auction has progressed. It might, and it might not, be a problem. For those for whom communication and visual impairments intersect, it may be difficult to verbalise game state but again it depends on the specifics of the individual. 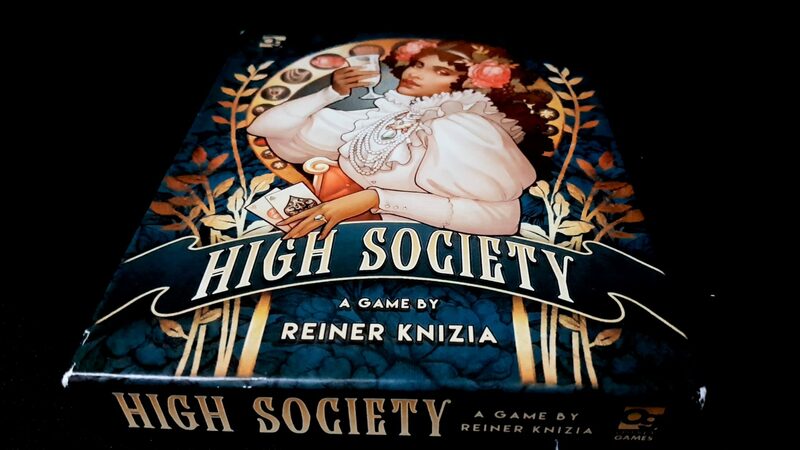 High Society plays briskly – around twenty minutes or so for a full game – and as a result it’s unlikely to exacerbate any issues of discomfort or distress. Play is low-impact even if it can be psychologically draining to assess all the ways you bid cards can haunt your future. It’s not really possible to drop out of play but it’s a short enough play time that it’s unlikely to be a problem. I always like it when a good game is broadly accessible – it’s my favourite conclusion in anything I do for the blog. It’s a shame that we can’t recommend High Society for those with fluid intelligence impairments but everyone else should be able to manage. Occasionally that’s true only with some compensations, such as would be needed to address the visual impairment issue for currency. 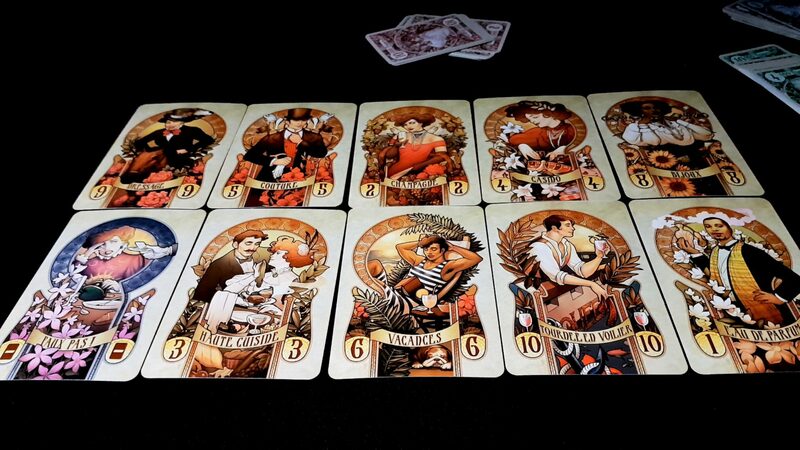 Still, this is a strong performance and it earns High Society a place on our ‘Accessible Games on a Budget’ list – that doesn’t happen as often as we’d like and so it’s great to see that there will be a new entry when we get around to updating that article at the end of the year. We liked High Society to the tune of three and a half stars. 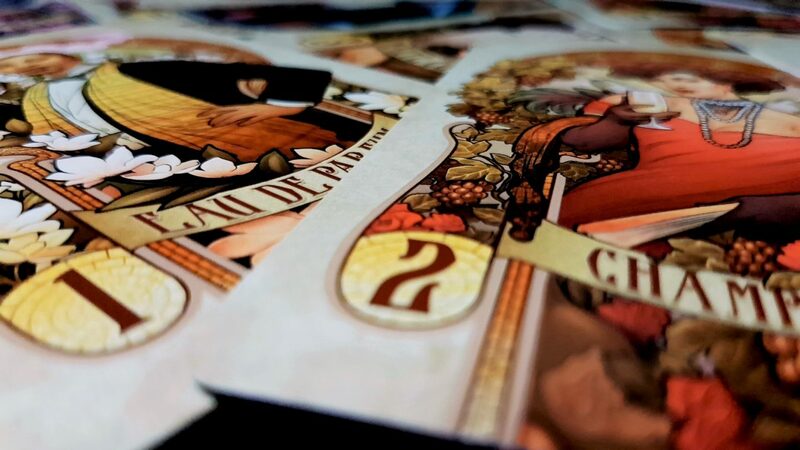 It’s not our favourite of Knizia’s auction games, but it’s certainly the most accessible we’ve looked at so far. If you like the sound of the game from our review, you’ve got ample reason to believe you’d be able to play the heck out of it.